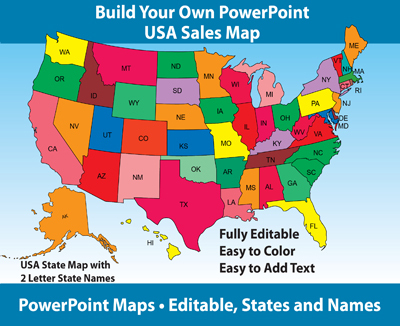 Canadian PowerPoint Map, 10 provinces and 3 territories, with editable province names, capitals, major cities, color, Alberta, British Columbia, Manitoba, New Brunswick, Newfoundland, Labrador, North West Territories, Nova Scotia, Nunavut, Ontario, Prince Edward Island, Quebec, Saskatchewan, Yukon Territory, includes Great Lakes and other lakes. A favorite for building sales and marketing territory maps, editable provinces. Each province is an individual object that can be colored an customized. You can change colors, pull out provinces to build regions, add a star for an office, edit the text. Each map comes already placed into a PowerPoint slide ready for customizing.